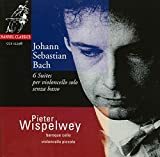 Bach again—in solo works, this time—the equally famous Six Suites for Unaccompanied Violoncello, played by Pieter Wispelwey on a Baroque cello and a violoncello piccolo. Like his colleague on Channel Classics, Rachel Podger (see post on July 7), Mr. Wispelwey (who is Dutch) has a knack for historical performance practices but is considered a "generalist specialist" with a wide-ranging repertoire from Baroque to contemporary music. Just as Nathan Milstein's DG recording looms over the solo violin sonatas and partitas, the patrician accounts of Pierre Fournier (Archiv—DG Originals) soar above and beyond the competition. Fournier has modest tempi (unlike the unfortunately bland and rushed Rostropovich [EMI]) and compared to the exciting if decidedly un-Baroque and idiosyncratic second Mischa Maisky recording (DG)—see the Ionarts double review of Maisky's recent concert in Washington, from June 10—Fournier is a veritable Baroque specialist. With tension aplenty, Fournier is always profound, persuasive, musical like few others and completely excels in the dance movements, especially the "French" ones. But, of course, Pieter Wispelwey is the true Baroque specialist, and as such, it is stunning how much energy he musters. More exciting than all but a few competitors, he doesn't have to sacrifice structure, tone, or rhythm to achieve it. Though far from hasty, he can be fleet on occasion, and Bach is meaningful for every second of the two hours and twenty minutes of music. With first-rate sound from the Channel Classics engineers, this makes a natural first choice for period performances and will be a standard bearer. The Fournier, with its surprisingly good sound, however, must also be had, and as the "anti-Fournier," the lovingly crazy Maisky deserves two ears. Ionarts in Manchester: Holy Cow!